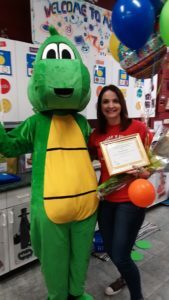 The Early Learning Coalition of North Florida’s Mascot Elsie surprises Teacher of the Year 2018 Angie Picket, Sugar and Spice Preschool, Orange Park, Fla., with award on January 9. 2019. ST. AUGUSTINE, Fla., February 19, 2019 – Whether exceptional teachers are born or made is not the question. What matters is that by the time they make it into the classroom, they are filled with the necessary passion, drive, education and genuine love of teaching children that students need to succeed. This critical need for exceptional teachers is why the Early Learning Coalition of North Florida (ELC) is proud to present its winner of the fourth annual Preschool Teacher of the Year Award to Angie Picket. Picket is a VPK teacher at Sugar and Spice Preschool in Orange Park, Fla. The six-countywide preschool teacher recognition is to acknowledge the creativity and hard work of those who teach children at the most fundamental time in their lives. “These are the kind of teachers that children will remember for the rest of their lives,” said Dawn Bell, ELC CEO. Bell is the leader of the 20-year-old nonprofit organization and the North Florida organization works with their partner, Episcopal Children’s Services to assure our providers have coaches, funds and often, volunteers for their learning environments. Picket was honored by a surprise prize patrol on January, 9th, 2019 with balloons and flowers. 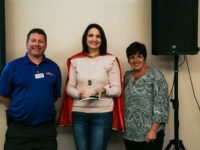 She was also recognized at the ELC of North Florida’s Early Educators Conference held on January 26, 2019 at the Thrasher-Horne Center in Orange Park. Picket was awarded a $500 cash prize from Kaplan Early Learning, Inc., the 2018 Teacher of the Year Sponsor. Picket is the educational director as well as lead Pre-K teacher at Sugar and Spice. She has a bachelor of Arts degree in education as well as a director’s credential degree. Picket started her teaching career as an elementary teacher. Then, building on the legacy of her mother, who founded Sugar and Spice, Picket made the transition to early education. “Children who have had Picket as a teacher are well-prepared for kindergarten and leave with the foundational school readiness skills that are necessary for success in kindergarten,” said Bell. For more information about the Early Learning Coalition of North Florida and its programs and services, please visit, www.elcnorthflorida.org or call 904-342-2267.